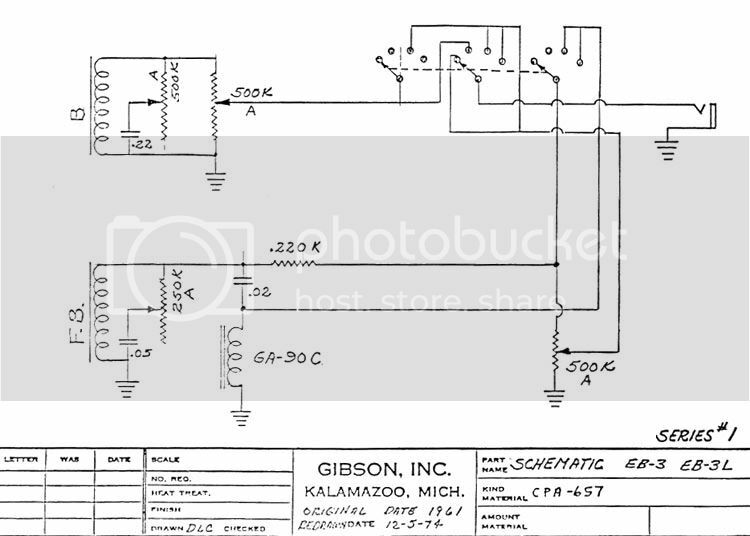 Does the current-production Epiphone EB-3 use the same wiring schematic as the "Series 2" Gibson EB-3 of the '70s? If not, can someone point me to a wiring diagram for the Epi EB-3? Yep, I've seen those. 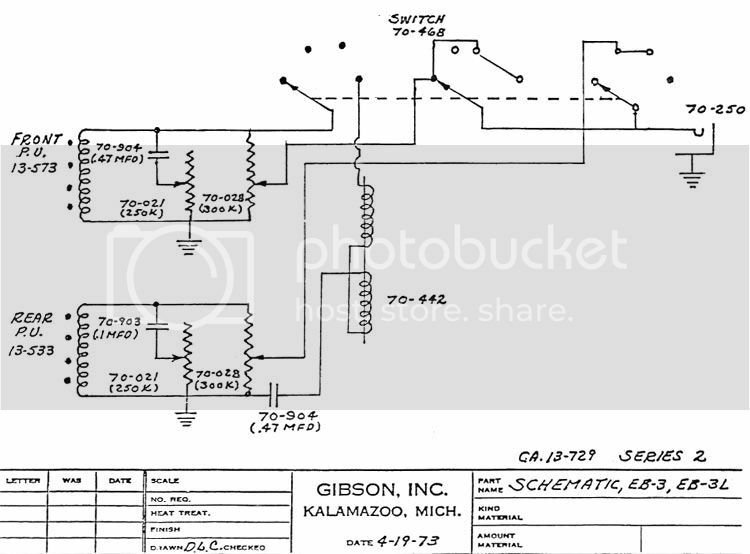 They show the wiring diagrams of the '60s and '70s Gibson EB-3. I'd like to see the wiring diagram for the current-production Epiphone EB-3, which I now know to have some differences from the instruments depicted in these images. I've restored a trashed EBO slothead in such bad condition there was no intrinsic value to preserve. It had a badly twisted neck, broken truss rod only half a fingerboard with melted markers and a snapped off headstock. I bought it for the price of a non working PUP ($40), and the carcass was thrown in for the cost of shipping. What I was aiming for was an interesting instrument for my young granddaughter. The result looks like an EB3, but is really much more versatile as a working instrument. This allows a nice transition of tone as well as allowing immediate switching between the JB and EBO sounds. I find the EBO coils in parallel makes a much more usable sound than the standard mudbucker series mix. A second push-pull switch on a pot allows phase reversing of the PUP mix. This provides a completely different palette of tones but without the dead notes usually found when phase reversing identical PUPs. The pots are set up to provide master vol/tone, and separate vol/tone for the EBO. The EBO vol/tone are used for balancing the PUP mix to a particular amp, and are generally not used while playing. In order to get series mixing of the PUPs, it is necessary to float the Jazz Bass PUP above ground. This requires meticulous shielding to eliminate hum. I shielded the inside of the pickup cover with copper foil as well as replacing the pickup leads with miniature coax cable.